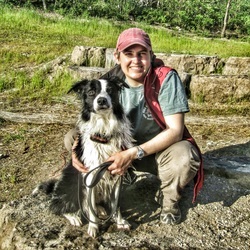 Angela Schmorrow fell in love with dog training when she adopted her first dog, Jade, in 2000, and over the years has enjoyed participating in a number of activities with all seven of her dogs, including agility, flyball, herding, and therapy dog work. Angela loves helping people build their relationship and have fun with their dogs, and believes in using force-free methods and positive reinforcement to make training enjoyable for both people and dogs alike. Through her volunteer experience at HSHV, she has had the great opportunity to work with and learn from a wide variety of dogs, and has enjoyed training volunteers and the community there for the last few years. 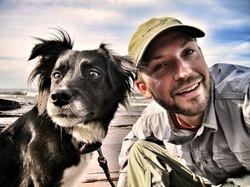 She finds it particularly rewarding to help dogs overcome fear, anxiety, and reactivity, and to help owners to better understand their dogs. Angela has been fortunate to have learned from dog training instructors from around the world and is always striving to learn more. Angela is a Certified Professional Dog Trainer – Knowledge Assessed, Karen Pryor Certified Training Partner, and an active member of the Association of Professional Dog Trainers. dogs more adoptable, and currently trains exotic animals including warthogs, reindeer, and emus at a non-profit sanctuary for non-releasable wildlife. Other training experiences include being an instructor at a summer camp for dogs as well as the development and execution of continuing education programs for shelter staff and volunteers. Lowell is a Certified Dog Behavior Consultant, Certified Professional Dog Trainer - Knowledge Assessed, an active member of the Association of Professional Dog Trainers, and is the former Chairman of the Board of Directors of Dog Scouts of America.